Hexcel Corporation has helped produce what it says is the world’s first 3D-printed commuter bike, using Hexcel carbon fiber. 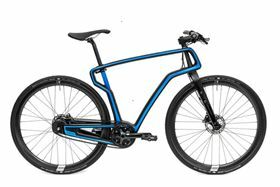 Hexcel Corporation has partnered with 3D printing company to produce what it says is the world’s first 3D-printed commuter bike, using Hexcel carbon fiber. The bicycle has a new design involving the removal of a seat stay between the seat and back wheel, adding strength and simplicity, the companies say. While other 3D printers typically print in two dimensions on a stacked horizontal plane, Arevo’s robotic arm makes all axes available, giving more design freedom, according to Hexcel. Arevo is using the bike to demonstrate its technology, which could be used to produce lightweight parts with improved strength for applications where designers want to make carbon fiber parts but are hesitant due to the high cost and labor-intensive process of making them. ‘With companies like Hexcel as partners, we are certain that we have the technology, team and tools in place to commercialize our software and fabrication process to build high strength parts that the manufacturing industry hasn’t been able to conceive and construct before,’ said Arevo CEO Jim Miller. The 3D printing company has secured financing to build on the full-scale commercialization of its technology for a range of industries such as aerospace, defense, transportation, automotive, consumer electronics, sporting goods, medical, and oil and gas. This story uses material from Hexcel, with editorial changes made by Materials Today. The views expressed in this article do not necessarily represent those of Elsevier. Lehvoss has partnered with Italian boat builder, Livrea Yacht, to build what it says is the world’s first 3D printed sailboat. Ian Gibson, professor of AM at Deakin University in Australia, has received an award recognising his lifetime contribution to the world of 3D printing.